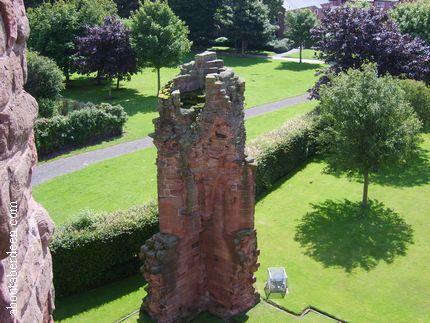 Photographs of Arbroath Abbey with a history of Arbroath Abbey and visitor information. 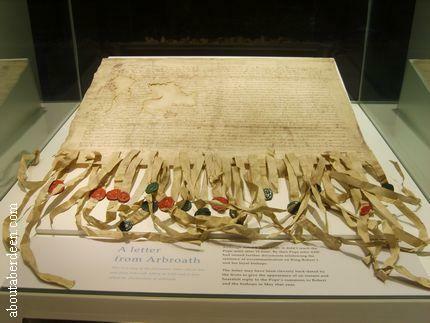 Includes details and photos of the Declaration of Arbroath. 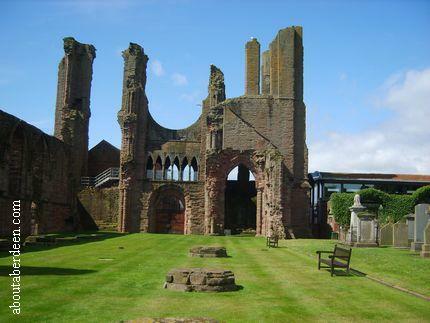 Arbroath Abbey in Scotland is located near the town centre of Arbroath on Abbey Street and is easily signposted. There is parking and several disabled car park spaces immediately outside Arbroath Abbey. A larger council run car park can be found to the left of the Abbey and is only a few minutes walk away. Entrance to Arbroath Abbey is via the Historic Scotland visitor centre and gift shop. A guide book is available and Historic Scotland members can claim 20% off the price of this and anything else bought in the souvenir shop. 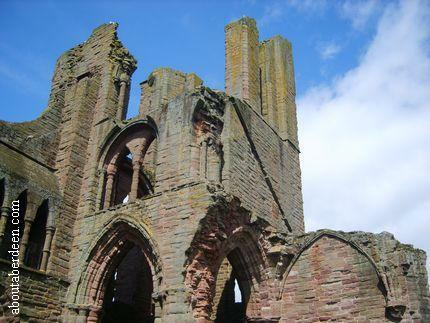 Arbroath Abbey is now in ruins but a tour around gives visitors an idea of how magnificient this Abbey would have been. As can be seen in the aboutaberdeen photos on this review page parts of the Abbey can still be accessed. The outside is suitable for disabled visitors though there are many stairs to access parts of the ruins. 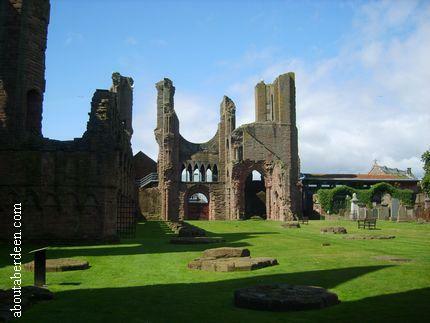 The history of Arbroath Abbey dates back to the year 1178 when King William I founded the monastery. As well as expanding his control through Scotland he wanted to honour the memory of his childhood friend Saint Thomas Becket who was murdered on 29 December 1170 in Canterbury Cathedral in England. Arbroath Abbey was built to what could be described as Gothic Architecture with three towers and the length of the Abbey was about 90 metres. The dedication of the church took place on the 8 May 1233. The two flanking towers were identical but the North Tower was raised after storm damage in 1272 which also destroyed parts of St Andrews Cathedral. Modern visitors to Arbroath Abbey enter the are through a glass door at the visitor centre and this gives access directly to the nine bay nave where the remains of column pillars can be seen. This are was the only part of the Abbey that the laity would have had access. Tironensian monks from Kelso Abbey in the Scottish Borders were invited by King William I whose nicknames were the Lion, Garbh (the Rough) and King of Scots. The monks thrived and the town of Arbroath expanded and they were largely responsible for the maintenance of Arbroath Harbour. 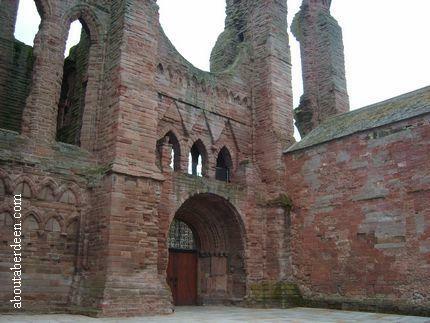 So large did Arbroath Abbey become about 35 parish churches evolved around it. King William I died at Stirling on 4 December in 1214 and was buried at Arbroath Abbey. He was succeeded by his son Alexander II. There were many Abbots of Arbroath. This included Cardinal Beaton whose murder and ghost can be read on the aboutaberdeen Ethie Castle and St Andrews Ghost pages. Notorious Abbots included Robert the eighth Abbot who was expelled by his monks in the year 1267. The Declaration of Arbroath for Scottish independence from the English was written on 6 April 1320 by a clerk of the Abbot Bernard who was the Chancellor of King Robert I. 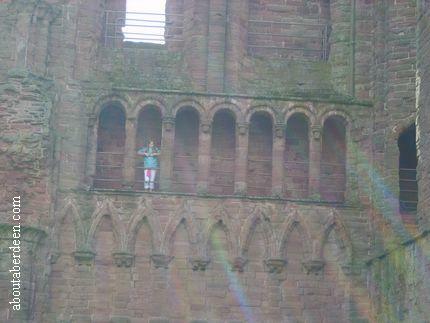 The document that was written in Latin is on display at Arbroath Abbey and can be seen in the photo below. It was dispatched to Rome to Pope John XXII and the seals of 51 magnates and nobles were inserted to the bottom of the letter. During the 1400s a sacristy was built into the Abbey Church by Abbot Walter Paniter. He also helped to improve the standards in Scotland's Benedictine Monasteries. During the Protestant Reformation of 1560 ArbroathAbbey began to decline though the Abbot's House largely survived because it had an alternative use as a Manse for the Parish Church. In later years it became a thread factory and then a school. Many other buildings were not so lucky. For example all of the infirmary and some of the cloister was demolished. 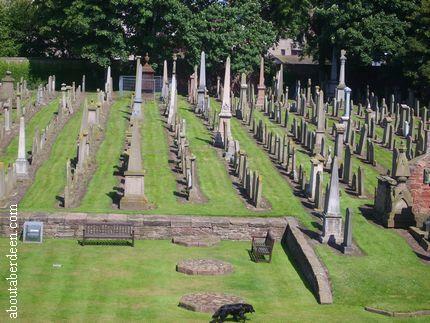 The burial ground used exclusively for the monks was thereafter used as a graveyard for Arbroath. 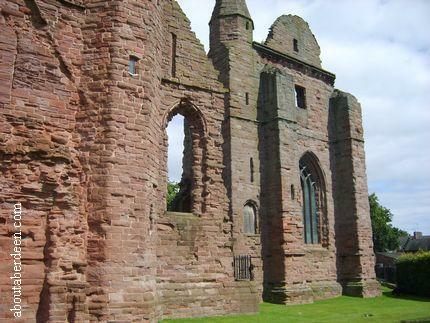 Dr Johnson visited Arbroath Abbey in 1773 and described it as Ancient magnificence. By this time locals were in the habit of using the building material for their own uses. It was not until 1815 that the historical importance of Arbroath Abbey was recognised. Money for conservation was provided by the Barons of the Exchequer. During this time a marble effigy was discovered that is thought to be a depiction of William the Lion. Arbroath Abbey continued to play an historic part of Scottish history when on Christmas Day 1950 the Stone of Destiny (also known as the Coronation Stone and Stone of Scone) was removed from Westminster Abbey by Scottish students and was found by police at the high altar of Arbroath Abbey on the 11th April 1951. 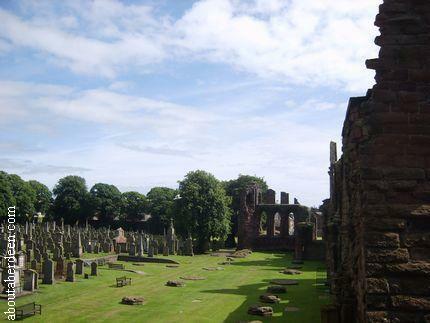 These days the tour of Arbroath Abbey takes visitors to the South Transept whose wall joined the Cloister Range and was famed for its acoustics. Upper floors housed the monks dormitory so that they had easy access to the stairs for services during the night. 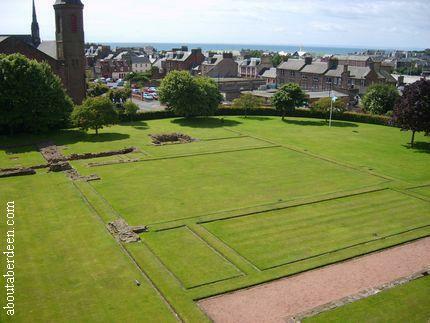 The gable contains the Round O which has become a famous landmark for Arbroath. The Round O was rebuilt by the Scottish engineer Robert Stevenson in 1809 when he was constructing the Bell Rock Lighthouse for the county of Angus. Walking into the Sacristy, where the priests stored their vestment and books and went to prepare for a service you should be able to see a small hollow in the sandstone wall. This is a wall cupboard known as aumbries. This large purpose built sacristy was built by the Abbot Walter Paniter in the mid 1400s. In the 18th century when the buildings in Arbroath Abbey was used as a lunatic asylum the Sacristy room was renamed after the last occupant and called Jenny Batter's Hole. The stairs would have led to the upper floor where the treasury would have been located. 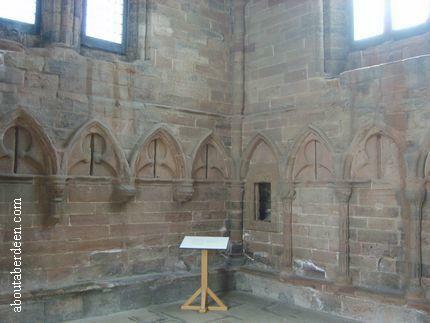 the Presbytery would have housed the high altar and the stalls for the monks choir. King William I was buried at the front of the high alter on the 10 December 1214. Triplets of windows have survived in the ruins and these high windows would have lit the Presbytery. A stone basin called a piscina can be seen and vessels used during the mass would have been cleaned in this double basin. These would have been stored in the aumbry which still survives. 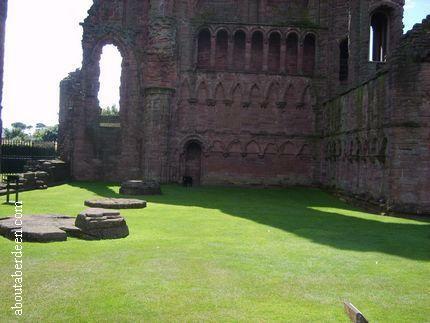 The cloister of ArbroathAbbey was an open courtyard area with the monks buildings around it. It gave access to many of the buildings used each day by the monks. The Refectory is where the monks ate and the kitchens were immediately next to them. Monks were noted for their hygiene which was unusual for the period. They would wash their hands in the lavatorium, which was the name for hand basin, before stepping into the refectory. It was normal practice in Monasteries for the Abbot to have a residence within the area but slightly apart from the monks. 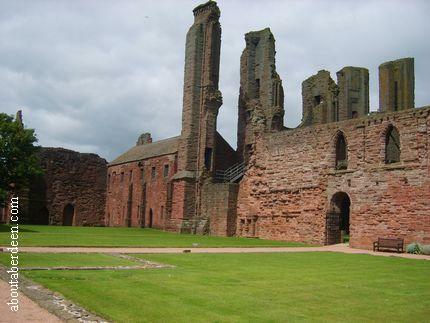 Arbroath Abbey was no different and the Abbot's House was located opposite the kitchen in the west range. 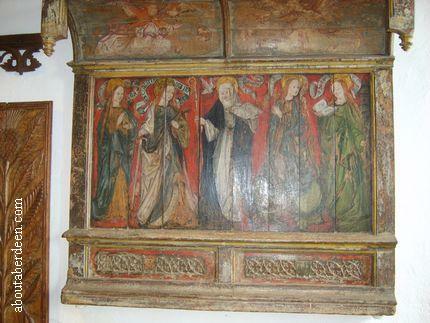 A decorated screen called a retable can be viewed in the Abbot's House. Each retable would have been used to decorate the altar. Panelling on the wall dates back to the 16th century. The ground floor was built with stone flooring whilst the first floor was made more comfortable for the Abbot. 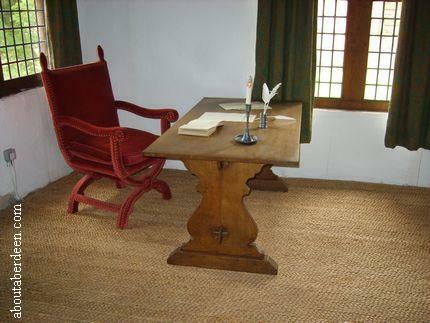 Today's visitor's can see a reproduction of what the Abbot's room would have looked like as in the picture below. 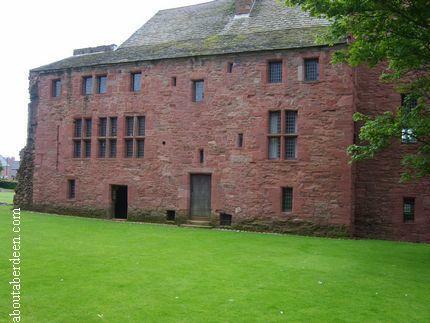 The gatehouse would have had a portcullis and the building was built like a Regality Tower with a hall and small bedchamber thought to have been used by senior monks. 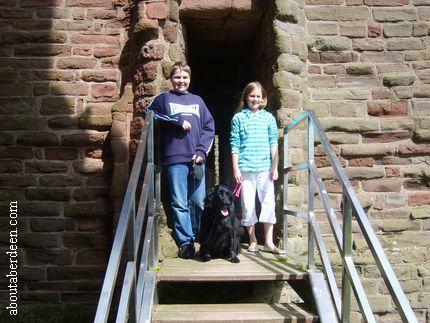 The Arbroath Abbey tour now continues into the visitor centre which opened in 2003. 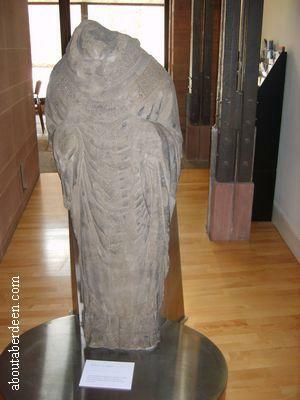 It contains many relics from Arbroath Abbey which includes a 14th century six arced drinking cup and a 14th century carved figure less its head which was found in the year 1815 in the North West tower. A quiz sheet for children can be obtained from the Historic Scotland guides. 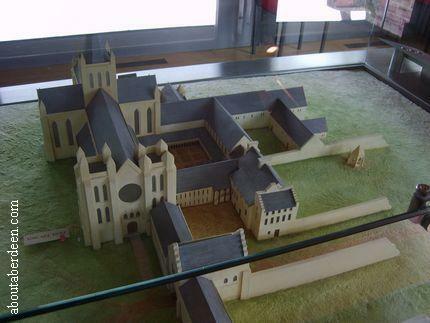 The upper floor of the Arbroath Abbey visitor centre has a large model of Arbroath Abbey which lights up to highlight where each area can be found. There is also a huge game of chess to keep the kids entertained. 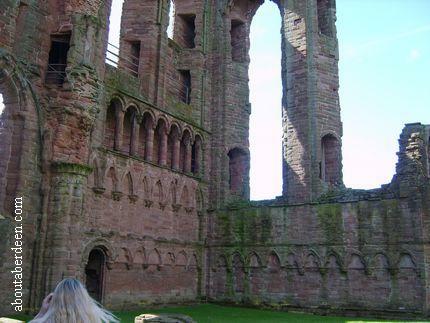 There is a small cafe selling hot drinks, cold drinks and ice-cream on the ground floor and a picnic area that overlooks the front of Arbroath Abbey. Toilets and a disabled toilet can be found to the rear of the visitor centre.